It’s not snowing yet, but it will be soon! The leaves are already starting to turn! Make this winter a fun, out of doors one with the Frostbitten Beret. 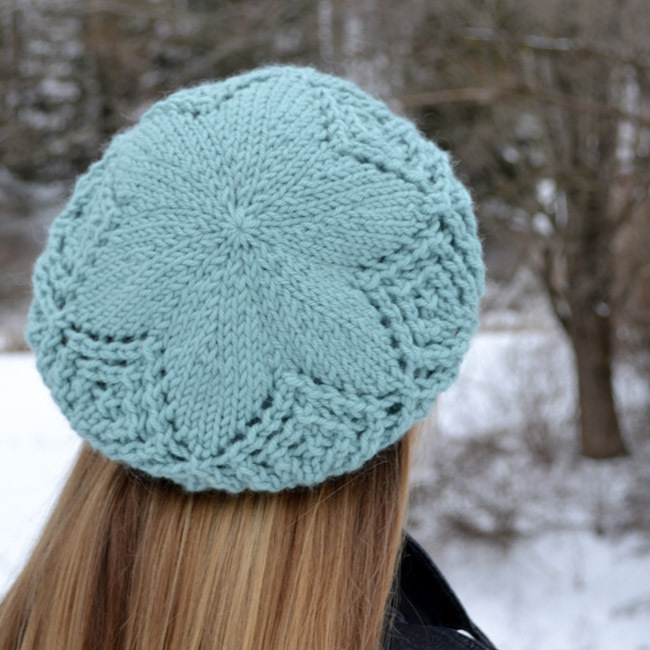 Inspired by the lovely, textural ice patterns found on a winter pond and knit in a bulky weight yarn, the Frostbitten Beret will keep you cozy and in style this winter, whether you’re chasing vampires or simply chasing away the cold! Details include a twisted rib brim and a diamond lace border that resolves into a lovely six-petal flower at the crown. This pattern is written for one size and fits an adult head size of approximately 21” – 23” (53 cm – 58 cm). This downloadable, PDF pattern has been professionally tech edited and test knit to reduce the potential for error. The pattern is charted, but also includes complete written line by line instructions so the ability to read a chart is not necessary to work this pattern. My sample was knit using (1) 3.5 oz/100 gr (110 yds/101 m) skein of Knit Picks Cadena (70% Peruvian Highland Wool, 30% Superfine Alpaca) in the lovely Sagebrush colorway. A perfect frosty blue! The Frostbitten Beret pattern is a quick knit, one skein project that can be completed in an evening or two making it a great last minute gift – even when you yourself are the lucky recipient! Full pattern details for the Frostbitten Beret can be found here.